I have two boys with allergies. My oldest has environmental and food allergies, and my youngest has one food allergy (he outgrew the others) and environmental allergies…and they both have asthma. I have no food allergies and an allergy to penicillin only. To say this has been a journey in knowing and accommodating their needs would be an understatement. Identifying the allergen, the many “middle of the night” hospital trips, and the continual precautionary questions to food establishments can be overwhelming at times, but we’ve learned and gotten through it. My now 10 YO knew at 2 yrs. how to say “Did you read the ingredients?” Plus, he had to learn early on that he might not be able to eat at the birthday parties (until his idiot mama wised up and began packing what he could eat). Watching my son with his staple backpack of an Epi-Pen, Benadryl, and his inhaler on his back everywhere we go is heartbreaking. But, he does it all in stride. 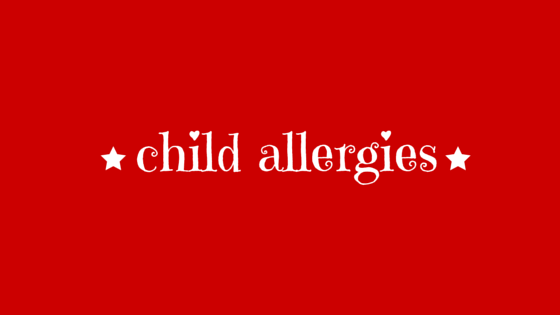 If your child is living with food and environmental allergies, I hope our journey through my blog gives you hope in knowing you’re not alone! And, If you’re just beginning this journey, this site is a great resource. Also, here are a few of my favorite “go tos” in my own sons’ journey of living with allergies: California Baby Calendula Cream , California Baby Calendula Shampoo & Bodywash , SunButter Natural Sunflower Seed Spread , Nature’s Bakery Stone Ground Whole Wheat Figs .